Telstra this morning announced that Penn, the current CFO, will replace the retiring David Thodey as CEO starting 1 May. Thodey took the reins from former CEO Sol Trujillo in 2009, after initially joining Telstra in 2001. Penn has been at Telstra for three years and was previously group chief executive of insurance company AXA Asia Pacific Holdings. “Over the last three years, we’ve developed a very clear strategy, and I’ve been part of that as a part of the team and therefore you should expect no substantial change to our direction,” Penn said on a conference call this morning. “The international arena will be an important area for growth for us,” said Penn, adding that he has a particular passion for the opportunities that exist in Asia. Telstra will continue a shift from its roots as a telephone company into a global technology company, he said. Penn has big shoes to fill after Thodey doubled Telstra’s value to more than $80 billion during his five years in the role of CEO. “I’m a little daunted by the challenge ahead … and following David’s legacy but I’m very excited and I’ll approach it with great enthusiasm,” said Penn. Thodey will remain CEO until 1 May and then will stay on until late August in an advisory capacity. On the call, Thodey said he plans to spend some time overseas and then come back and explore his options. “I look forward to contributing maybe in a non-executive role going forward,” both nationally and internationally, he said. Thodey said he had been thinking about retirement for some time. Telstra took a few months to search for replacement both inside and outside the company. 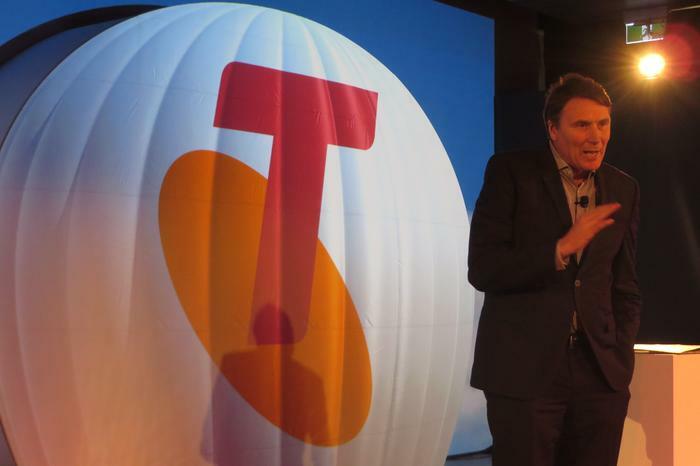 Telstra CEO David Thodey lays out the telco's Wi-Fi strategy. Thodey said one of his biggest challenges while serving as CEO was negotiating the National Broadband Network (NBN) contract with the government. “When I became CEO, the whole scenario was difficult,” he said. “The government had decided to proceed with the build of the NBN. We had to go through a number of negotiations and understand how that would work in terms of their build and that transition, and the relationships were not open and transparent at that time, and there was little trust I think between the company and the government at that time, and also I think with regulators and other people in the industry. “So it took time to go through building that trust, but also the complexities of a rebuilding of a national bit of infrastructure that had been privatised. There were so many regulatory considerations, legal considerations, commercial considerations, that it was just very complex and it took us … two and half years. Besides the NBN, Thodey said his biggest challenge has been uniting the company around customers. Thodey said he had no regrets, but there are things he’d like to have done more including further improvements to customer service and greater gender balance and equity. Thodey announced his departure with Telstra in a strong financial position. The Australian telecom powerhouse last week announced strong financial results for the half-year ending 31 December, and earlier this week opened a multi-million dollar “Customer Insight Centre” to showcase its products and services.